How to repair a corrupted Skymedi SK6213 flash disk .Learn how to format SK6213 chip controller by using SK6213 PDT 20100209A Maxell firmware .Repair corrupted Skymedi SK6213 controller now . SK6213 PDT 20100209A Maxell has been designed to reformat and repair corrupted Skymedi flash drives with the following Chip part number SK6213 controller .SK6213 PDT 20100209A formatter can fix Sky medi SK6213 format errors such as write protected flash disk ,Raw flash drives ,Please insert disk error message ,Windows unable to format disk error message and more format issues . SK6213 PDT 20100209A Maxell format tool has recovered successfully the following USB flash disk " Everon USB flash disk 4GB with Skymedi SK6213 chip controller also recovered Samsung USB flash disk with K9ABG08U0M chip memory with VID = 1516 , PID = 1213 .You must determine your flash disk chip vendor first then search about format firmware ,you can use Chipgenius software or USBDeview V2.30 utility. There is another Format software can help you to format SK6213 if this software doesn't work so please visit this article " Skymedi SK6213 PDT firmware update" . How to format SK6213 flash controller ? Download SK6213 PDT 20100209A Maxell.rar from download links below . 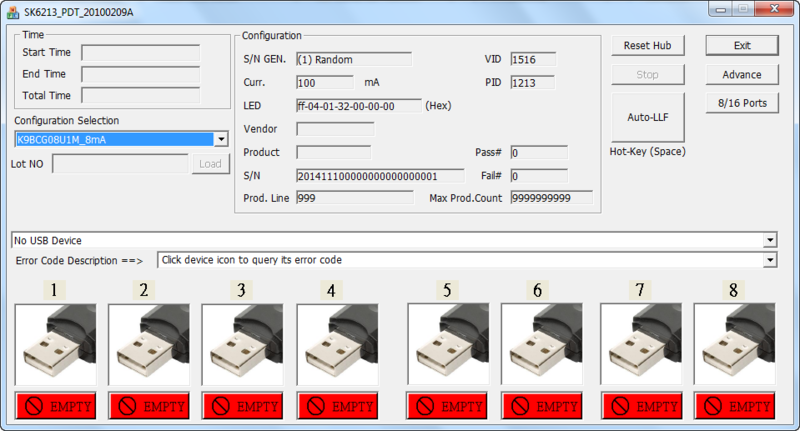 Insert corrupted SK6213 flash drive to your PC . Extract SK6213 PDT 20100209A Maxell.rar and open SK6213_MP_TOOL_2010_02_09.exe. If your Flash controller is SK6213 , your flash info will appears on the program interface. Click Auto LLF to make low level format for your flash disk .